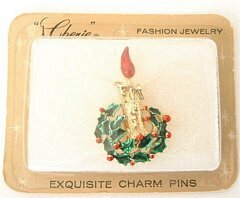 Vintage 60's/70's Candle Wreath Christmas Pin still sealed in its original, unopened package. "Cherie" Fashion Jewelry Exquisite Charm Pins". Pin measures 1 1/4" high.